How to Install Windows XP in Just Minutes and save a lot of time by using a simple to use trick. As We know when we are installing Windows XP on a Computer, it takes too much time to install and to copy files. Specially Installation of files takes more time that is very boring and bad for a computer user. 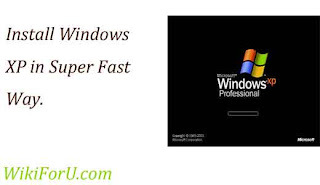 Every user want to finish his/her work more fast and i think every techy guy must want to install Windows XP in his Computer system in a very fast way. So if you also get bored from long processing installation of Windows XP then just follow the instructions given below and see the wonder. Do all other jobs as same as usual unless you get installation window. i.e. Now choose options as you want and let Windows copy installation files. Now when your Personal Computer restarted and when installation just started....Press Shift and F10 Keys simultaneously. Now Windows will open Command Prompt that is DOS. Task manager will be opened. Look for Setup.exe then right click on it and set priority to High.